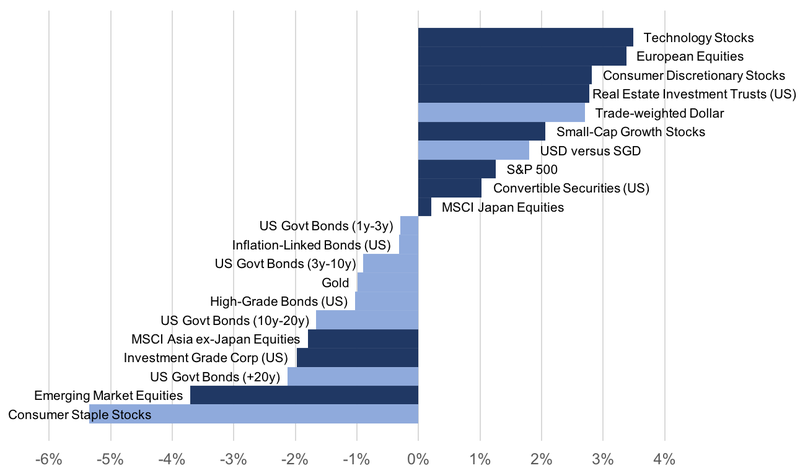 With the exception of emerging market equities, which have been hurt by a rebound in the US Dollar, most growth-oriented assets have regained their shine. In particular, US technology, European equities, and consumer discretionary stocks are so far the outperforming asset classes in Q2. Recent increase in the yields of 10-year US government bonds above 3% (the annual interest paid) was psychologically a watershed moment for bond investors. It has helped put “yield differential” back in the driver seat for global currency moves: this means higher US bond yields could drive the greenback higher. In simpler language, if US bonds pay higher interest than international bonds, global investors buy more USD-denominated bonds, driving USD higher in value. Between 29 March and 4 May, the US Dollar rebounded by 2.7% and 1.8% against the trade-weighted basket and versus SGD, respectively. Hiring in the US has rebounded and unemployment rate has fallen below 4% for the first time since December 2000. As wage growth has been tepid, inflation-adjusted growth is likely to continue to improve from here. Granted that trade tensions remain unresolved, leading economic indices for major economies in the world have continued to point to resilient growth trends. We confirm that what growth assets have been going through since the sell-off began on 29 January is a correction, not a bear market. A study of past corrections of the S&P 500 has shown that it takes an average of 4 months to recover, and we are currently 3 months and 1 week into the correction. With strong global growth momentum and significantly fairer valuations than before, this is an attractive opportunity for medium and long-term investors to let dollar-cost averaging work in their favour. ...and we’re still in a correction. But it's now at least confirmed that it's definitely been just a correction. The earnings season has clearly demonstrated the resilience of growth-oriented assets and particularly the strength of the technology industry. It was not all smooth sailing at first, as the earnings season kicked off in April with lacklustre results in the semiconductor sector. Adding to negative sentiment back then was the lingering trade tension between the US and China. In the end, fundamentals trumped short-term “noise”. For example, Apple’s earnings were in line with analysts’ expectations, and Facebook beat its earnings’ expectations by 25% and its Q1 2017 results by 62.5%. By 4 May, growth assets have emerged from the earnings season as the outperformers. As an industry, technology stocks were the leader and collectively delivered 3.5% of returns between 29 March and 4 May (Figure 1). The gains in technology were followed closely by European equities and consumer discretionary stocks, which gained 3.4% and 2.8%, respectively. Interestingly, US REIT, which is a rate-sensitive asset class, has defied the recent rise in government bond yields, gaining a respectable 2.8%. On 25 April, yields on 10-year US government bonds have broken the big-figure of 3%, a first since December 2013. The breach of the 3% level has a huge psychological impact on investors and effectively thrust “yield differential” back to the spotlight. As the US Federal Reserve is the only major central bank leading the departure from ultra-low rate policy, rising yield differential (in favour of US versus others) can see a re-strengthening of the US Dollar in the short term. In fact, the US Dollar has since rebounded 2.7% and 1.8% on a trade-weighted basis as well as against the SGD, respectively. A stronger US Dollar tends to be negative for emerging market equities, as companies in those markets generally have debts issued in USD. A stronger USD could mean that debt obligations are growing as well. Emerging market equities, as an asset class, was the second-worst performer, as seen in Figure 1, losing 3.7%. Lastly, stocks in the consumer staples sector have underperformed the most (they lost 5.3%), as they tend to be sensitive to rising commodity prices. Although the sector has recently underperformed, there is value in having some allocations to consumer staples, as the sector has historically offered good diversification in economic contractions. Looking at all data from all recessions between January 1982 and December 2016, the consumer staples sector has posted an average annual return of +2.2%, offering a good mechanism to balance portfolio risk. Starting with the US, the largest economy in the world still looks good and inflationary pressures remain benign. In particular, the payroll figures for April have shown that hiring has rebounded and US unemployment rate has fallen below 4% for the first time since December 2000. At the same time, wage growth has been tepid with average hourly earnings, having increased by only 0.1% MoM and 2.6% YoY; both measures are below economists’ projections, reinforcing the US Federal Reserves’ stance to keep rates unchanged. The Fed also made suggestions that inflation is near target but that there is no need to accelerate the pace of rate hikes. In summary, the macro environment is supportive of steady growth without inflation being a major issue, and historically, this has been very good for growth-oriented assets. Granted that trade spats may continue to be instigated by the Trump administration, leading economic indices across major economies in the world have continued to point to positive growth trends. As shown in Figure 2, leading economic indices suggest that the Chinese economy currently has the largest positive momentum. This is next followed by the Eurozone, Brazil, and the US. Although there are some headwinds confronting Japan and the United Kingdom, their growth momentum are merely slightly negative (as opposed to large negative). Overall, global growth trends are solid, and there are larger number of countries with positive momentum than otherwise. Note that momentum is defined as the rate of change and computed as the latest index level minus the average index level over the last 3-4 months. A bear market rarely starts with an economy that is continuing to improve. It also certainly does not start with a bang. Instead, what growth assets have been going through since the sell-off began on 29 January is a correction, not a bear market. A study of past corrections of the S&P 500 has shown that it took an average of 4 months to recover (see row labeled as “Corrections(10%-19.9%)” in Figure 3) and we are currently 3 months and 1 week into the correction. With strong global growth momentum and significantly fairer valuations than before, this is an attractive opportunity for medium and long-term investors to let dollar-cost averaging work in their favour. If you’ve read our previous CIO Insights, this is going to be boring, but as said by Paul Samuelson, “Investing should be more like watching paint dry or watching grass grow. If you want excitement, take $800 and go to Las Vegas." Medium and long-term investors should maintain a dollar-cost-averaging strategy, and continue to fund a diversified portfolio with the right mix of protective and growth-oriented assets. For longer term goals (10+ years), a higher percentage of the portfolio should be invested in growth-oriented asset classes, for medium term goals, the portfolio should be more balanced.